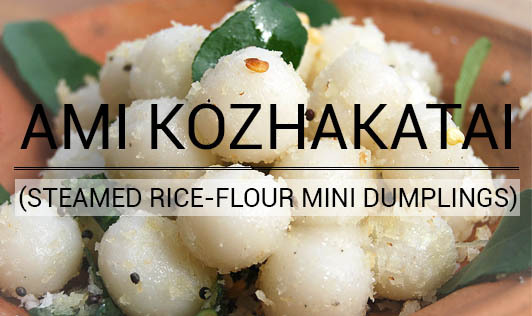 Ami Kozhakatai is a delicately-seasoned dish, which makes a delicious snack option for kids. It is easy to make this dish and it only requires a few common ingredients. Mix rice flour, salt, and 1 ¾ cups of water in a bowl to make a smooth batter of pouring consistency. Grease a nonstick pan with a little oil, pour the batter, and cook it on medium flame, while stirring continuously till it leaves the sides of the pan and gets the consistency of dough. Keep aside. Transfer the dough to a plate (greased with oil) and knead it while it is still hot using ¼ tsp of oil. Knead until the dough turns smooth. Cover the dough with a muslin cloth for 5 to 10 minutes. Rub a little oil on your hand and make 35 to 40 small dumplings. Steam the dumplings in an idli steamer for 5 to 7 minutes and keep aside. Heat the remaining oil in another nonstick pan and splutter mustard seeds. Add urad dal, red chilies, asafetida, and curry leaves and sauté on low flame for a few more seconds. Add the steamed rice dumplings, toss, and cook well for another minute or two. Garnish with coriander and coconut.